PDFX-ready is a Swiss initiative founded in 2005. The goal is to promote and facilitate the use of the PDF/X ISO Standards for the exchange of printing data. PDFX-ready creates guidelines, instruction sheets (called recipies), application settings (colour, pdf export) and preflight profiles. The PDFX-ready specifications are based on the PDF/X-Plus specifications of the Ghent (PDF) Workgroup. Of particular note is the 2015 updated Guidelines for creating PDF / X-4 files, which can be downloaded from the website of the Swiss initiative. 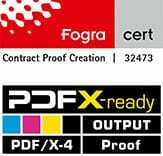 The Proof GmbH is PDFX-ready and certified member of Output Proof of PDF / X-4 files. More information can be found on the website of PDFX-ready.